After an afternoon soaking that saw squeegees being applied to the greens, and then second-round play suspended at 2:11 p.m., players and fans were greeted by sunny skies and light breezes for Saturday morning’s third round of the AT&T Pebble Beach Pro-Am. Locals and frequent visitors to the Monterey Peninsula are well-acquainted with the bipolar nature of the weather here, especially in January and February – not for nothing is the term “Crosby weather” universally known around here. Saturday’s weather, though not as severe as during Friday’s second round, had an impact on the leaderboard, with some players taking advantage of the more sheltered conditions at Spyglass Hill to move up the leaderboard – which is unusual in that Spyglass is, in general, the more difficult of the three courses in the rota. The near-pristine morning conditions deteriorated midday, with rain and fitful onshore winds making life difficult for players at Pebble Beach, slightly less so at the MPCC Shore Course and Spyglass Hill. Fifty-four hole leader Paul Casey, of Great Britain, had one bogey against six birdies in third-round play at Spyglass, closing out the third round at five-under on the day, 15-under for the tournament. 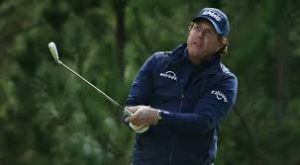 He leads four-time winner AT&T Pebble Beach Pro-Am winner Phil Mickelson by three strokes. The 2001 AT&T Pebble Beach Pro-Am was Casey’s first professional tournament. He missed the cut that year, and the next, and didn’t return to Pebble Beach until 2018, when he finished T-8, due to his focus on playing the European Tour. This will be Paul Casey’s third time sleeping on a 54-hole lead of three shots or more on the PGA Tour; he lost on the previous two occasions, once to Dustin Johnson and once to Rory McIlroy. Casey and amateur partner Dean Colleran, an executive vice-president at FedEx, finished 54 holes atop the pro-am leaderboard, and are in with a chance to post the first double win since 2016, when Vaughn Taylor and amateur partner Gregg Ontiveros hoisted both trophies. There have been ten pro/pro-am winning duos in the event since 1959, when pro Art Wall won with amateur partner Charlie Coe. Notable pros who also won the pro-am title include the Bay Area’s own Johnny Miller, San Jose State golfer Arron Oberholser (in a tie), and Phil Mickelson. Easily the most noteworthy pro/pro-am dual winners were D.A. Points and perennial amateur competitor comedian/actor Bill Murray, who won in 2011 in a finish reminiscent of Murray’s famous “Cinderella Story” monologue (as groundskeeper Carl Spackler) from the 1980 movie Caddyshack. Top finisher among NorCal-associated players, and one of only two to make the cut in the pro tournament, is 2013 Cal grad Max Homa, who carded a 33-35–68 round at Spyglass Hill to bound 49 spots up the leaderboard to T-28. This will be Homa’s second time in the final round at the AT&T Pebble Beach Pro-Am in four tries; in 2015 he finished T-29. Sacramento’s Cameron Champ carded a somewhat Jekyll-and-Hyde one-under 70 at Monterey Peninsula Country Club in the third round to make the cut, with a stroke to spare, at three-under, T-47. His 36-34–70 round on the Shore Course was less evenly played than the numbers might suggest, with two bogeys, a double, and two birdies on the front nine, and four birdies and a bogey on the back. Stockton’s Ricky Barnes, whose mixed bag of results in the AT&T Pro-Am includes five finishes outside of the top 40, five missed cuts, and a solo third, in 2012, bid fair to make the cut this year, standing as high as T-31 while playing the front nine at Pebble Beach today. Six bogeys and a birdie on Pebble’s back nine, as the rain and wind picked up midday, dropped Barnes 48 places to T-82 and out of the final field. Nick Watney, who didn’t make the cut in the professional field, will be playing with his amateur partner, financier Julie Frist, in the Pro-Am field on Sunday. The Watney/Frist team, playing at Spyglass Hill in Saturday’s third round, moved up 10 spots on the pro-am leaderboard, to T-10, with a score of 19-under. San Francisco native Kira Kazantsev, 2015’s Miss America, will be playing in Sunday’s final round with pro partner Ryan Armour, who also missed the cut in the pro event. The Armour/Kazantsev team made the 25-team pro-am cut at T-18, with a score of 18-under.